Apples, pears, plums, cherries, peaches, nectarines, grapes and citrus fruits can all be grown in containers as dwarf trained forms. In my opinion all of these trees are attractive in themselves, especially when in flower and fruit, and therefore no apology should be made for including them on a patio. They can be enhanced by growing them in classical square wooden tubs, painted white. Diameter and depth should be 45-60 cm (18-24 in). 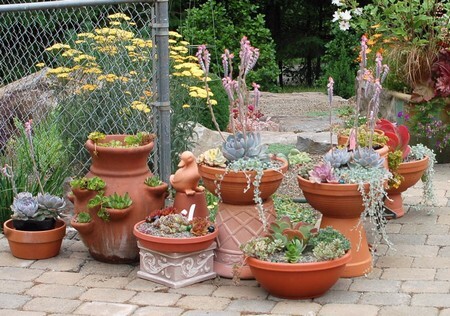 Containers should be filled with a soil-based potting compost, making sure there is a good layer of drainage material in the bottom, such as crocks or broken clay flower pots. Fruits need a warm, sunny, sheltered spot. Take care with watering to ensure the compost does not dry out, nor becomes excessively wet. Feed once a week in the spring and summer with a high-potash fertilizer. Fruits should be thinned out to ensure the trees do not carry an excess. Fruit trees require regular pruning but as this is quite an involved subject and varies according to the type of fruit and the form in which it is grown, a specialist fruit book should be consulted. Most of the fruits described here are trained as dwarf bush trees or dwarf pyramids and they should be obtained on dwarfing rootstocks to keep them small. With apples and pears you have to grow several varieties to ensure cross-pollination of the flowers, otherwise few if any fruits will be produced. If space is very limited you could grow a ‘family’ apple or pear tree -which has several varieties grafted onto it. Apples on dwarfing rootstock M9 or M27 should be bought, and grown as dwarf bush or dwarf pyramid trees. Make sure the varieties cross-pollinate each other. For instance, you could grow together the varieties ‘Cox’s Orange Pippin’, ‘Greensleeves’, ‘Discovery’, ‘Ashmead’s Kernel’ and ‘Egremont Russet’, all good popular varieties. Pears are grown in the same forms as apples. Again grow at least two varieties to ensure cross pollination: the popular ‘Williams’ ‘Bon Chretien’ with ‘Conference’; or ‘Doyenne du Cornice’ with ‘Beurre Hardy’. All are good well-known varieties. With cherries buy a self-fertile variety such as ‘Stella’ which needs no other variety to pollinate it. It should be bought on the dwarfing rootstock ‘Colt’ and grown as a dwarf pyramid or bush. Also with plums, buy a self-fertile variety, like the highly popular ‘Victoria’. It should be on the dwarf rootstock ‘Pixy’ and grown as a dwarf pyramid or bush. Peaches and nectarines are grown as dwarf bush trees. Remember that the flowers, which appear early in the year, have to be pollinated by hand by dabbing the centre of each flower in turn with a soft artist’s brush to transfer the pollen. Citrus fruits, like the sweet orange, Citrus sinensis, and the Seville orange, C. aurantium, can be grown as dwarf pyramid or bush trees. Remember that these are tender trees and need to be kept in a frost-free greenhouse or conservatory over the winter. Figs must also be overwintered under glass to protect the young developing fruits from frost. Grow figs as bush trees. The grape vine is very amenable to training and for container work is conveniently grown as standard: that is, a single permanent stem with most new growth being produced at the top. The overall height is about 1.8 m (6 ft). All the shoots which form the ‘head’ are cut back to within one or two buds of their base each year in early winter. 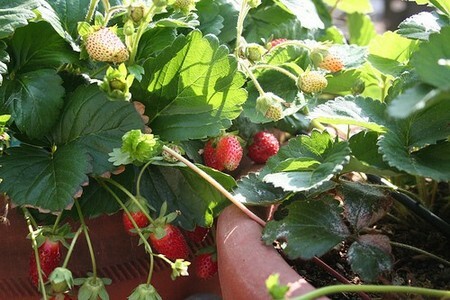 Strawberries can make an attractive feature on a patio, especially if grown in proprietary Tower Pots on the modern patio; or in strawberry barrels on the cottage patio. The Tower Pot basically consists of a tall cylinder with planting pockets in the sides, while the strawberry barrel is an ordinary timber barrel with 5 cm (2 in) diameter holes drilled in the sides, about 20 cm (8 in) apart, in a staggered formation. The roots of the strawberry plants are inserted through the holes as the barrel is being filled with compost. Finish off with several plants in the top, too.